Welcome to this journey through a world that has for too long been hidden from all but the most courageous of searchers and mystics. 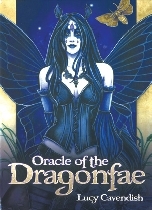 Within these pages, and on each of these magickal cards, you will be introduced to and given messages and wisdom form the boundless world of the Dragonfae, a world which is now ready to be seen by your eyes and experienced by your heart. When we connect with the Dragonfae, we reconnect with the lost parts of ourselves, allowing us to fully explore the gift of life on this beautiful planet. They help us to access knowledge from deep within and reconnect us with the knowingness that we are all one.